This limited edition artists' book explores the phenomenon of prize vegetable growing. 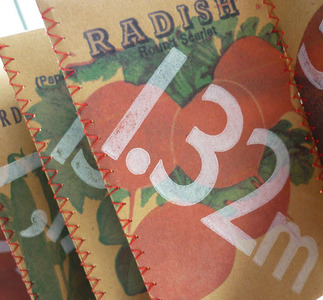 Each replica seed packet is over-printed with data that relates to a current world record holder. Further facts appear on the back to help put the statistics into context. The book was produced for a 'call for entries' to submit books that responded to the theme of 'crop'. Concertina book – machine stitched. This book has been submitted to exhibition entitled 'Crop', where all the selected entries will be on-line and a cropped selection will appear in cases at The University of Northampton. This artefact has been purchased by the University for the Creative Arts for their library collection.